(1908-1914) Dr. James came to Western from Germany's Halle University in 1896 to teach modern languages. 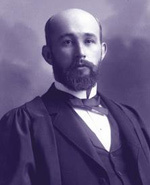 A graduate of the University of Toronto, James was appointed registrar and bursar in 1898, three years before being elected Western's provost when a change in the constitution allowed someone other than the principal of Huron College to be so. A decade later, he became Western's first President and Vice-Chancellor. In this role, he consolidated and strengthened the Faculty of Arts and lobbied for provincial support of a secular university, all the while continuing to teach in order to retain contact with the mainstream of university life. Although offered positions at other universities, such as chair of the University of Chicago at a salary of $5,000 (Western paid him $1,200), James turned these offers down because he was determined to firmly establish Western. As evidence of his commitment, he was often seen riding his bicycle through London city streets at month's end to call on donors for help in paying the University's professors. In his book Western's First Century, historian J.R.W. Gwynne-Timothy wrote: "With kindly dignity and patient skill, Dr. James guided the University through its difficult years of transition," adding, "almost single-handedly he kept the University alive."